This is one of the best Professional Hair Steamer availble in Indian Market. Most of these stremers are used by Professionals running saloons. 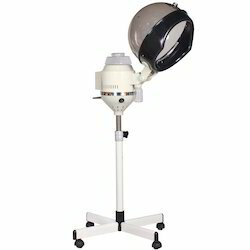 - Base Diameter: 27" x 27"
- Height Adjustment: 50" - 61"
Our clients can avail from us hair steamer, which are available in various specifications as per the clients’ specific requirements. Further, these steamers help in treating the damaged hair more effectively and at very less time. With our expertise in this domain, we are able to offer a superior quality range of Hair Equipments. Being a client centric organization, we believe in providing the best-in-class products to our most esteemed clients. All our products are manufactured under the hard and fast compliance with the international quality standard.